When you find a parish church remote from its village, as you often do in Suffolk, it is pertinent to ask why. More than once I've read accounts in church guides blaming the Black Death, but there's no real evidence to suggest this was the cause of the isolation of any Suffolk churches. 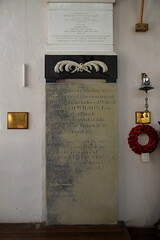 But the removal of the village of Bildeston from its parish church is fairly well-documented and researched. Here, beside the church, are traces of a substantial manor house. Until 1960s hedge-removal and deep-ploughing destroyed them, there was also evidence of other dwellings, smallholdings, farmsteads and tenements. 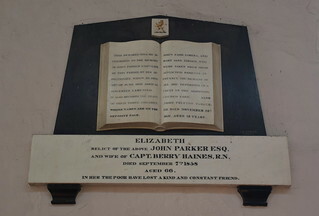 They were much older than the church, but, of course, this church was built on the site of its predecessor, located for the convenience of the manor house. So, why are there no houses here now? 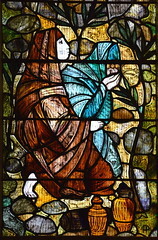 Some time in the 13th century, people from this parish migrated down to the river valley, possibly to be near resources for the budding cloth industry. Soon, this new community was active enough to merit a market, and here, on the main road between Stowmarket and Hadleigh, it became a busy one. Changing patterns of agriculture in the late medieval period meant the disappearance of the remaining community from around the church, and so now St Mary Magdalene stands grand, isolated, and half a mile or so from the large village (almost a small town) of Bildeston. This, conversely, makes Bildeston a rather curious village, since it has a typical Suffolk market place, except for the fact that there isn't a church on it. 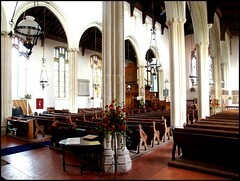 At one time, St Mary Magdalene stood rather more grandly than it does now. On the morning of May 8th 1975, however, the villagers were startled by a tremendous roar. It was the sound of the tower of their church collapsing. 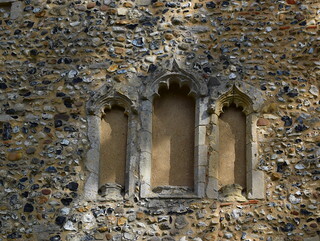 Tower collapses were common enough in 18th century Suffolk, as 200 years of post-Reformation neglect took their toll. But the Victorian restorers had largely done away with this problem (although the unrestored tower at Stanton All Saints had collapsed as recently as 1906). Here at Bildeston, ironically, the tower was undergoing radical surgery at the time, and the medieval bells had already been removed. The photograph inside the church of the morning after the collapse shows the rubble interlaced with scaffolding, which has splintered like so many matchsticks. 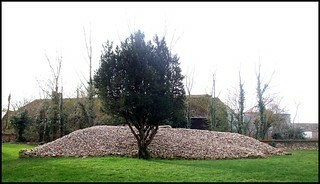 Until a couple of years ago, the remains of the tower still lay in the graveyard, a heap of flint and freestone to the north of the new tower, but they have now been removed to be reused in the construction of a barn and some nearby holiday homes. The replacement tower is topped by a bare, functional box, with a slender little spire on top, which, try as I might, I cannot find beautiful. It does, to its credit, accentuate the height of the nave and chancel, the pretty clerestory of which is picked out in flint and brick. 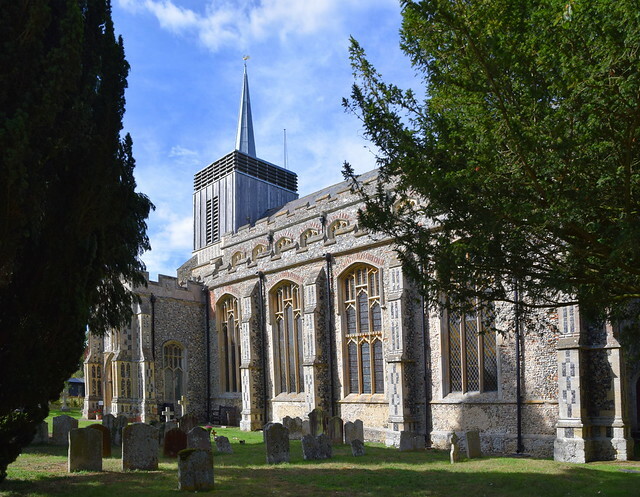 This is a typically grand Suffolk church, like near neighbours Hitcham and Rattlesden. The sloping churchyard is neat and trim, with large trees surrounding it. The whole piece rides the fields like a ship in a storm. 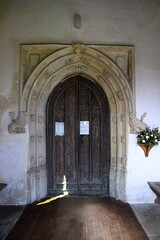 The south porch is also typical of late medieval Suffolk, its grand flushwork a testimony to 15th century piety and Marian devotion. The doorway must be among the best in the county of its period, and has echoes a few miles off at Hitcham and Thorpe Morieux. 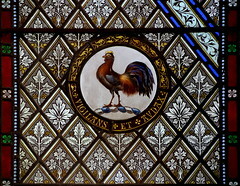 This was the corner that the fall of the tower took out, and as part of the repair a typically excellent window by Pippa Blackall of St Mary Magdalene and St Mary Salome at the empty tomb was installed at the west end of the south aisle. 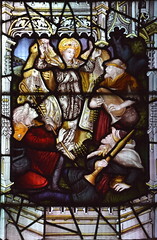 St Gabriel rises magnificently above them. 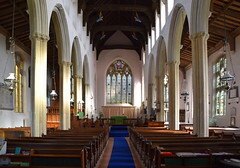 The great size of the interior is accentuated by the lack of a chancel arch, and triumphant arcades march eastwards in a manner reminiscent of thir near contemporaries at Lavenham. 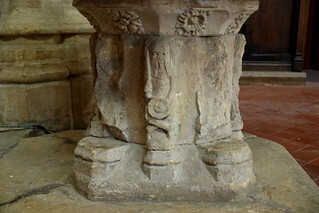 The capitals depict circles of tiny angels, all of them slightly different. 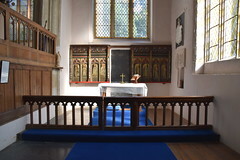 The south aisle is now rededicated as the chapel of St Nicholas, and retains the sanctuary furnishings of Wattisham parish church, declared redundant by the diocese in the 1970s. 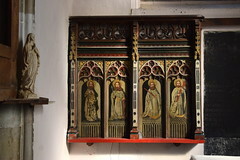 The dado of the roodscreen, with restored saints, forms two parts a reredos separated by a beautifully lettered ledger stone. 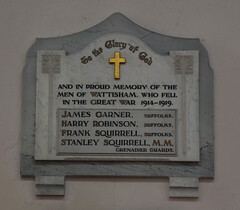 Memorials removed from Wattisham church, including the war memorial, are also here, which seems a pity when they were part of the history of their former building. Such removals were unusual, but presumably happened in this case because it was thought demolition of Wattisham church was a likely possibility. Thankfully, it still stands. 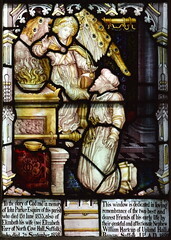 The most striking feature of the south aisle, and of the church as a whole, is a large 1890s window by Kempe & Co. I must say that I am not a fan of the workshop, but this is very good of its kind, depicting as it does small vignettes rather than large subjects. 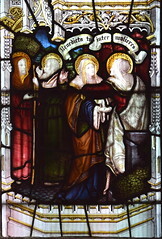 The main subject is the Annunciation, but also shown are the Visitation, the angel appearing to Zechariah in the temple, and the angel appearing to the shepherds in the hills above Bethlehem. The clerestory continues right up to the east end of the chancel. Looking westwards from here, the high clerestory, and the repairs after the tower's collapse, seem severe, almost austere, the tiny sanctus bell window punctuating the vast wall. 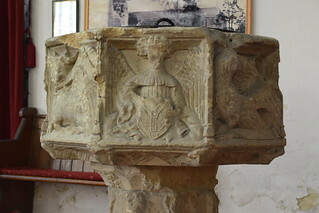 The large 15th Century font is quite lost in the space below it, and is in any case rather battered, but worth a look because one of the wodewoses around the stem is holding a sword and a shield. A tremendous amount of careful restoration has gone into this building over the last quarter of a century, and it is not surprising that it has lost the patina of age that one might expect. 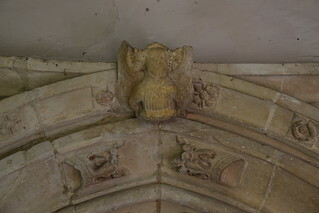 However, another survival from the past can be seen up in the chancel. 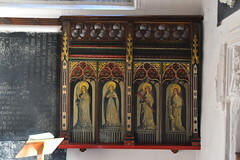 The stalls, with battered misericords, were, Mortlock says, removed from the now-vanished chapel of ease of St Leonard down in the village. A survival that might have been, but wasn't, is the roodscreen. Without a chancel arch, it must have been enormous. It survived the Reformation, it survived the Puritans, only to be destroyed in an 18th century reordering.